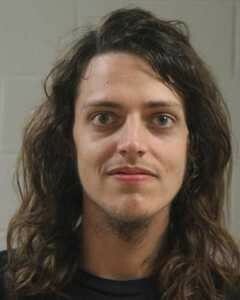 WASHINGTON CITY – A St. George man was arrested Tuesday for possession of controlled substances and drug paraphernalia in a drug free zone, after being served with a warrant for failure to appear in court. Charles D. Olson, 23, of St. George, was arrested and charged with two second-degree felonies for possession of controlled substances; and two Class A misdemeanors for possession of a controlled substance and possession of drug paraphernalia. Washington City Police Public Information Officer Ed Kantor said Washington City Police Officer Laynce Bartruff made contact with Olson in his vehicle while trying to serve a warrant at 195 E. Telegraph. According to court documents the warrant was issued for failure to appear in court on a previous offense. The suspect was found in possession of new and used syringes both on his person and under the passenger seat of his vehicle along with wrappers on his person containing the drug Suboxone, Bartruff said in the probable cause statement supporting the arrest. After Bartruff informed Olson of the warrant and the fact that he was being arrested, Olson stated that “he had a syringe in his front left pocket and he did not want me to get stuck by it,” according to the probable cause statement supporting the arrest. Several needles were located under the passenger seat of the vehicle along with a box containing several items of paraphernalia, a spoon with brown residue and a burnt bottom, several cotton filters, syringes, baggies containing a white crystalline substance, and other miscellaneous items used for consuming narcotics, according to the statement. The white crystalline substance tested positive for methamphetamine, a cotton filter tested positive for heroin; and two Suboxone wrappers were found in Olson’s wallet, Bartuff wrote in the probable cause statement. Suboxone is a medication used to treat narcotic addiction, according to WebMD.com. Olson stated that he had a prescription for the Suboxone, but did not have it with him, Bartruff said in the statement. The charges were enhanced due to the proximity to an LDS church – a drug-free zone. Olson was transported and booked into the Purgatory Correctional Facility where he remains in custody on a $44,410 bond, according to booking information. Born and raised on a farm in Northern Utah, Craig Bennett has been broadcasting live traffic reports in Southern Utah on the seven Cherry Creek Radio Stations for over 10 years. He also wrote and reported news stories for Newstalk 890 KDXU for over seven years. A former volunteer Firefighter, EMT and current private pilot, he describes himself as a news junkie. He loves to fish, hunt, camp, jet ski and any other outdoor activity.